In today’s trucking industry, there are many factors one must consider when buying a forklift. Of course, the very first factor here is the price of the vehicle. The second is its value, which is something you can derive from several variables, including the anticipated lifespan, expected usage, and the role, the function of the device itself. So many manufacturers tend to offer innovative technology in order to help organizations meet up their material handling needs. At times when it comes to purchasing forklifts for sale, it is important that you conduct a thorough research and try to find out the right model that will be ideal for your workplace, warehouse, and operational needs. Regardless of what purpose your forklift should serves, from our experts at Moffett Truck, here are some of the things you need to look out for when buying a forklift. Is it a Used or New Forklift? Often this age-old question continues to circle in the minds of all prospective buyers who come to us to buy the forklift of their choice. You should know that purchasing a new forklift definitely costs much more than a used forklift for sale. On the bright side, with a used forklift, you will have peace of mind, especially because you will know that the previous owner tested it well. It means the vehicle meets the standards of the job you need it for in Alabama. 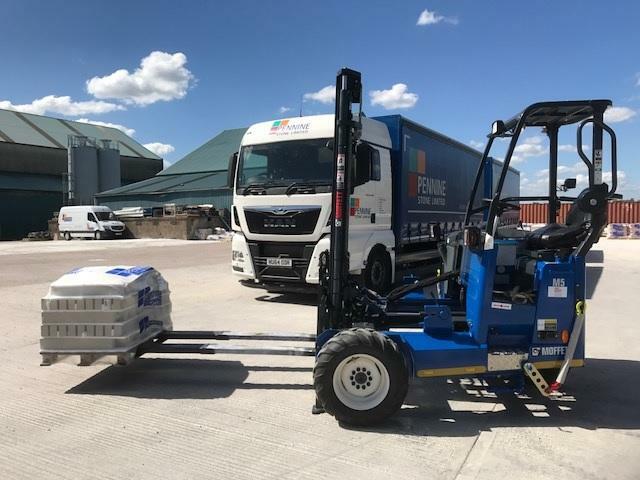 However, with used forklifts, in most cases, it could be difficult to ascertain the previous history of repair and any of the functioning problems the device could have over its lifespan. If you choose to buy a used forklift, it is important that you acquire the vehicle from a reputable distributor or dealer that will provide a comprehensive history of the use of the machine as well as other problems that may have incurred. Another important consideration that you must meet when hunting for a forklift is the variety or type of forklift that should suit the needs of the material handling tasks and the general requirements of utilization, specifications of organizations. In general narrow aisle, forklifts tend to cost cheaper than the larger versions. Of course, this is due to several reasons. The first is the machine is cheaper and requires less time and parts to produce. The second is that such forklifts require fewer fluids and maintenance as their function is limited and simple. The narrow aisle forklifts are much better for tiers and mezzanines, where traditional forklifts are inoperable. Traditional forklifts are suitable for bulk and heavier use, and they depend more on situations and scenarios. In any event, it is important to assure that the job will fit the vehicle and the personnel is well capable of using the new addition to their fleet. At Bobby Park, we have different forklifts in our inventory from brands including Moffett, Teledyne, Hyster, Yale and traditional. Before you close the deal on any forklift, it is best that you consult our experts first. Clear all your doubts to learn about the model best suitable for your business operations and the history of the vehicle.